2006, I remember it well. The World Cup had just finished. I don’t usually remember World Cup’s or indeed where they are played, but this one sticks in my mind. The reason I remember it is because we’d purchased a caravan and were waiting for the World Cup to finish so that we could pick it up. But why did we need to wait? Was it because we were so hooked on the World Cup we were too scared of missing “that game?” You know, the won were England lift the Cup for the second time. Well, no, that wasn’t the reason. England scrapped through to the Quarter finals and lost to Portugal. No, the reason we delayed picking up our caravan was that we we collecting to from Monchengladbach. The reason it has a very German sounding name is that it is in Germany. The reasoning behind getting our very first caravan from Germany were economics. We knew we wanted to caravan, we didn’t want to buy a really cheap caravan to see if we’d like it, we had a very good idea that we would like it. 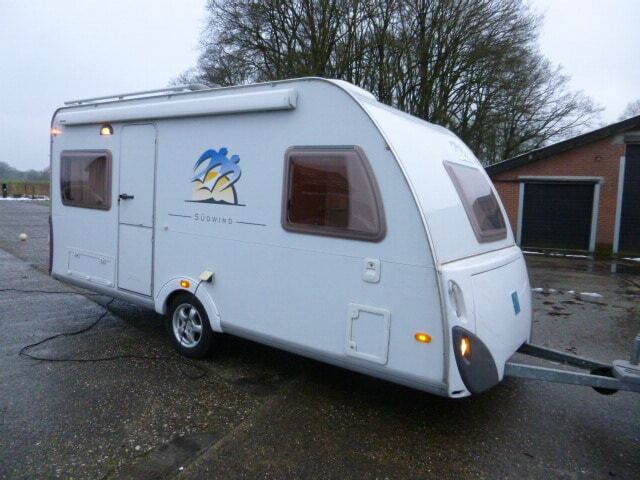 The Euro was at a very favourable rate, so we did our research and decided on a German caravan, which we’d buy without actually seeing it in the flesh, we’d obviously “googled” it to death whilst researching. 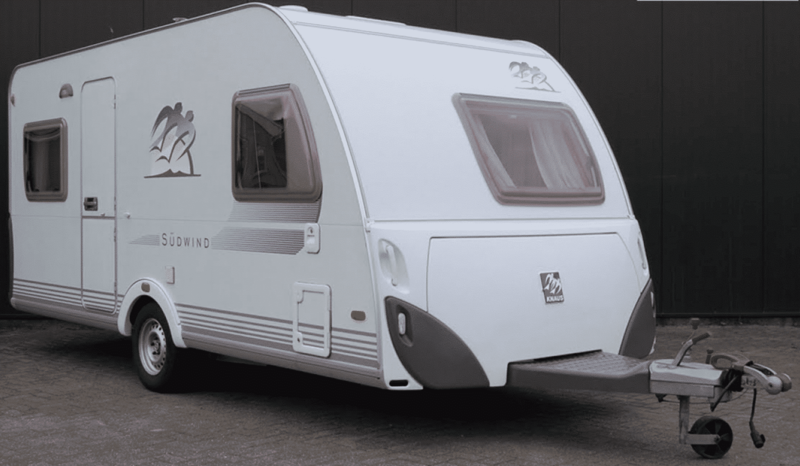 It was at the time where all British caravan had two seven pin sockets, whilst Europe was using 13pin tow bar connections. Knowing little about these things I got a tow bar fitted and when asked if I wanted a 13 pin, or 2 7’s I asked for their recommendation and ended up getting 2 * 7 pins, then had to buy a converter cable, which was a pain. We didn’t know. When I look at the route, it doesn’t seem that far and indeed, we did it in one day. 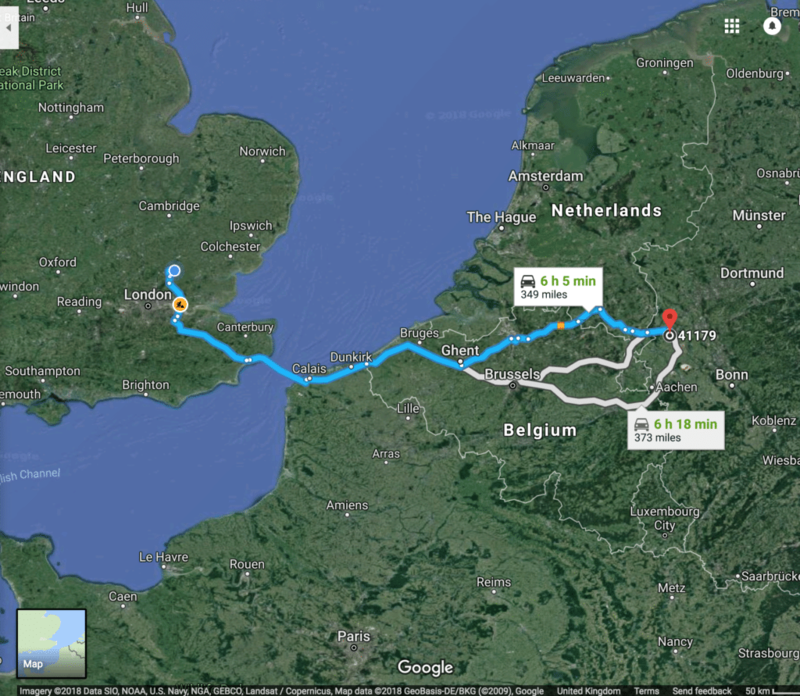 We left early in the morning and got to Monchengladbach for 10:00AM. We left our home 30 miles north of London at silly O’clock to board the ferry to Calais and drive the distance from there to Germany. The trip was nicely uneventful and we arrived in good time. The dealership really couldn’t be more helpful and maybe UK dealers could learn a few lessons in communication. We weren’t the only UK people collecting caravan’s either, which made us feel a little less like lunatics, maybe this wasn’t such a ridiculous idea. I sat down with the salesman and we went through the normal procedure when buying something and I handed over the Banker’s Draft for payment. He took one look at it and said he didn’t recognise the Bank (It was Nationwide) Oh, this could be an issue. He went away for what seemed an age. When he arrived back he was smiling and said that his Father (the owner) knew of it and everything was fine. Phew. We next had a tour of the caravan he pointed it out and said he’d meet us there in a few minutes to show us how things worked. So we wondered off all excited, like kids really. Actually one of us was a child, I took my daughter with me. I stepped into the caravan and someone shouted something. What he actually said was that the corner steadies weren’t down. I didn’t even know what they were (all the gear and no idea). I made my way to the back of the caravan with the corner steadies up. Yep you guessed it.. Crash! Obviously I felt a complete fool, they absolutely must have thought I was a lunatic. No damage done. I’d not really been in a caravan before. My parents didn’t have a caravan, they didn’t even drive so we never had a car. Surely nothing else could go wrong. Amazingly I remembered to take a number plate for the caravan, I remembered the converter cable from two 7 pins to a 13 pin connector I even remembered the towing mirrors, remember I had NEVER towed anything before! After our guided tour of how things worked it was time to hook up. I handed the man my number plate to fix to the Caravan. “What is it with you British, why do you have to do everything differently from the rest of Europe? Your number plates are a different size. Everyone else in Europe has one size, I have to get different number plate holders just for the UK.” He was laughing whilst he said it and there was no malice in his voice, he genuinely thought it amusing. Then he looked at my convertor cable, picked it up, held it aloft and nodded towards it, “these too, why do these have to be different?” I shrugged, it was a rhetorical question of course, he didn’t need an answer from me. He plugged it in, it didn’t work. Oh great. Soon another man appeared with a wooden board with lights on it symbolising indicators, brake and reversing lights. I think the 2 seven pin cables were one for the external lights and another for the caravan internal power, I could be wrong. Anyway after some time they managed to get enough of a connection to get the indicator and brakes etc working, I’d get a replacement when back in the UK. As a nice gesture they gave us a good discount on anything we bought in their shop, which is a great idea when starting out and I think UK dealers do the same. Off we went to their nicely stocked shop and bought a groundsheet, crockery (some of which we still have 12 years later) and a few other bits and pieces, which I’ve since forgotten! Then it was wing mirrors on and the long drive back to Blighty towing what for most of the journey back I kept thinking was a white van driving far too close to us! Only a few minor dramas on the way back. Firstly, getting diesel, I stopped at two service stations and without knowing it pulled up to the HGV pumps and the nozzle didn’t fit my car. Oh my life we also use different pump sizes, I mean who knew? But wait surely not? I only did this as these pumps were more out of the way and easier to get the caravan in. The last one I tried, as I was running on fumes, I went to the car pump and it worked fine. Secondly the Sat Nav stopped working, I didn’t realise the cigarette light wasn’t working properly so it wasn’t charging my TomTom. We didn’t have a map and on a motorway in the Netherlands the screen went blank. I did manage a repair after pulling over. Lastly getting through the narrow lanes at Dover in the customs area, in the dark, was a challenge..
Rather oddly, the Knaus had the fixed double bed at the front of the caravan and the lounge area and the back. Of course, for us, we knew no different and the layout worked really well for us. As with European vans the door is on the wrong side, which is pretty inconvenient and if we’d thought about it enough we probably wouldn’t have bought one for that reason alone. Most people said to us not to get one from Germany, what if something goes wrong? You can’t just take it back. Well, after 3 years we had an issue with the door handle. I emailed the dealer with some photos, they mailed back saying it was a common issue, they sent me a new parts for free, and I fitted it myself. Job done, no need to book a German holiday! We sold it 4 years later to an English guy living in Germany and he basically did the reverse trip to us. With the exchange rates as they were in 2010 we sold it for almost what we paid for it. We didn’t know at the time, but the German van layout is quite a bit different to UK caravans. The fixed bed is at the front and the U shape lounge is at the rear. We actually liked this layout. Lovely read Graham. Very interesting to hear of your experiences with going to Germany to buy. Thanks John. I wouldn’t do it again, I have to say. Having now owned a caravan designed for the UK market, I see that we were missing out on quite a bit. Like microwave, usable oven (for a roast!) exterior gas point, a more plush / homely interior. We came to the conclusion that with most of Europe having better weather, they spend more time outside their caravan. Whereas we’d spend more time in it, so “luxuries” are more important..